It was such a sensitive and touching film to watch. Even though Jack and Ma have lived isolated from the outside world for Jack’s whole life in ‘Room’ (which is literally an enclosed shed), Ma nurtured, protected and educated her child in such an admirable way. Ma was about my age (18-ish) when she was kidnapped, and 19 when she had Jack. Because of that, I empathized with Ma, and her level of bravery for the survival of her child is one that I don’t think I would ever have. It’s a very on-the-edge kind of film, because even though both characters are seemingly safe and sound within Room, the kidnapper is always luring outside. And if he has been able to keep them both kidnapped inside for so many years now, he must really be dangerous. Watching the film made me think about all the possible things that Ma could have done to escape the place, her thoughts and feelings while captive, etc. At the end of the film, when Ma and Jack manage to return back home, some moral implications – the ones Ma have been fearing – come to light. Put on the spotlight, Ma is confronted with daunting questions such as whether she considered taking her life while being held captive, or why she didn’t ask for Jack to be sent for adoption. Such inquiries question the ability of the mother, and what she could have done to best help her child. On the back of my mind I did think about these questions too, but I never really doubted whether Ma had done the right thing or not. Ma was Jack’s biological mother, and though Ma was not in a suitable position to have him, she did everything she could to protect him from the intruder and teach him about the world. Why didn’t she kill herself before (or after?) she had Jack? I’m assuming that at the beginning she held on to hope, but when Jack came, it became different. I’m no mother, and am too young to understand it, but when you have someone you love unconditionally relying on you, your life purpose becomes that person. Your first priority becomes ensuring the safety and health of that person, and that’s what Ma did. And to some extent, that was reciprocal. She didn’t ask for Jack to be sent for adoption because she needed Jack to hold on to her life, to hold on to that string of hope that enabled her to reach freedom at the end. Both Brie and Jacob did an excellent job, if you ask me. I have no idea how you can teach a child to act out something that has such complex underlying meaning behind it, I really don’t. As for the setting and cinematography, I felt it was quite complementary as well. Most of the film takes place inside Room, and I saw everything that I needed to see in there. I love how Jack starts the film narrating the story – it adds that innocent and pure touch that lies within a child living in a bubble, yet surrounded by a more turbulent reality. The film was lovely – I have no complains. I particularly enjoy these type of films because of the moral implications and how much it makes me think. I love the suspense and the retrospective point of view. Oh, and thank god it had a happy ending 🙂 A undetermined/sad ending always makes me feel unsettled. 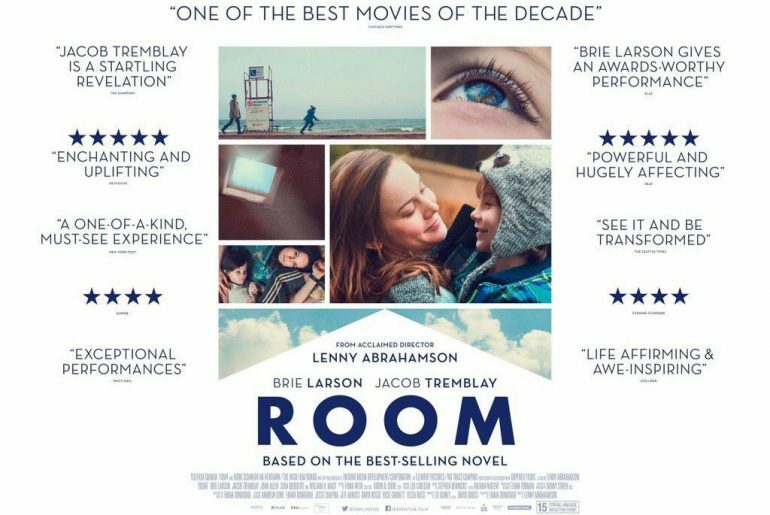 The film is rich in both content, acting and cinematography, so I don’t think there’s any reason why you wouldn’t enjoy ‘Room’ unless you don’t like films about suspense/drama/personal dilemmas. It’s very thought-provoking, and so I recommend it to you, whoever you may be. Go watch it. He is indeed! And so smart too! I want to read the book too, but I have planned to read other books first so idk ? You should watch the film ASAP though.